Some beefs are so juicy they just keep on giving, long after the initial diss and even longer after anyone remembers who started it. The ongoing feud between Machine Gun Kelly and Eminem shows no signs of letting up. Although some rappers will happily end their feuds onstage or on social media, this is Slim we’re talking about, a rapper who’s famous for his no holds barred attitude to almost everything he does. So why would another rapper pick a fight with him? Well, you can’t make an omelette without breaking some eggs. It’s just weird Machine Gun Kelly picked an egg as big as Eminem. Slim’s legions of fans are obviously wondering the same thing, too. At a recent Fall Out Boy concert, where Machine Gun Kelly was the supporting act, the rapper obviously didn’t come across well while he performed his now infamous diss track about Eminem, Rap Devil. The rapper also posted a picture of himself in front of the large crowd, apparently taunting Eminem with the audience behind him while wearing a t-shirt of Eminem’s ‘Killshot’ post. he missed. ???‍♂️?? ?#legshot #rapdevilstillNUMBERONE #letstalkaboutit ??? However, according to reports, the crowd were not as into it as MGK made it look. In fact, after taking the photo, he was booed off stage. Fans were quick to call him out for it under the allegedly staged photo. MGK took this photo in front of the Fall Out Boy audience that was waiting for them to come on stage and do their set. He was wearing a jacket when he asked the crowd if they would put up their middle fingers for a picture, he turned around to take the jacket off and they had no idea what shirt he was wearing. He couldn’t pull a crowd this big, of course they were excited, they were waiting to see the band that they actually paid for! 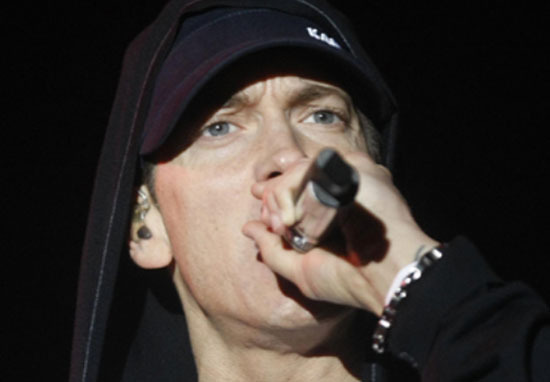 Earlier this week the details of the pair of diss tracks got a whole lot deeper. Producer Ronald Spence Jr. – also known as Ronny J – worked with both rivals on Rap Devil and Not Alike. Ronny co-wrote and produced MGK’s Rap Devil, and produced for Eminem’s Not Alike and The Ringer. Furthermore, eagle eyed fans have noted how Rap Devil was uploaded six months ago by MGK; thus ‘proving’ the 28-year-old rapper didn’t write, record, master the track – plus music video – in a mere two days. Will the feud ever reach a conclusion? Only time, or another diss track, will tell.